Honda has packed 449 cm3 of four-stroke power into an engine that has a mass of only 29 kg (65 lb) but that produces 41 kW (55 hp). The needle-bearing connecting rod follows two-stroke practice, reducing the need for oil in the crankcase. The power and weight advantages of two-stroke engines in applications for which those factors are significant have long meant that two-stroke engines were preferred for small motorcycles, scooters, and personal watercraft. But tightening exhaust emissions requirements have encouraged renewed interest in developing four-stroke engines for such applications. Along the way toward building cleaner engines, some advantages have been realized for four-stroke engines. Off-road motocross racing places an absolute premium on the power-to-weight ratio of the motorcycle. More power means better acceleration, and lighter weight makes the bike easier to ride while also contributing to quicker takeoff. A normally aspirated four-stroke engine is unlikely to ever match the power output of a similarly-sized two-stroke, but race-sanctioning bodies apply equivalency formulas that let bigger four-strokes race against smaller two-strokes. The leading class of motocross (and supercross, its indoor variant) is the 250-cm3 category. Organizers let 450-cm3 four-strokes race against the 250-cm3 two-strokes in this class, and Yamaha recently has had success with its YZ426F four-stroke motocrosser. The discovery, upon the re-introduction of four-strokes to motocross racing, was that while power was comparable, the power delivery of the four-stroke bikes is easier for riders to manage, giving them an edge over their two-stroke-mounted competitors. Honda has responded with the CRF450R, an off-road race bike that employs a 449-cm3 four-stoke engine to compete against smaller bikes. Output is 41 kW (55 hp) at 9000 rpm and 49 Nm (36 lbft) at 7000 rpm, from a bore and stroke of 96 x 62 mm (3.8 x 2.4 in). The compression ratio is 11.5:1, and redline is 11,200 rpm. Honda claims its expertise in Formula One racing enabled it to produce a 96-mm (3.8-in) diameter piston that is 33.6 mm (1.3 in) tall and has a mass of only 261 g (9.2 oz). A program of extreme attention to weight has produced a motorcycle with a claimed dry mass of 102 kg (225 lb) (claimed motorcycle dry masses are notoriously optimistic), compared to 97 kg (213 lb) for Honda's benchmark CR250R two-stroke racer. The CRF450R's single-cylinder and single-overhead cam engine has a mass of only 29 kg (64.5 lb). Honda claims that while the CRF450R's frame is not interchangeable with that of the CR250R because of different engine mounting and clearance requirements, the two bikes are otherwise virtually identical. The CRF's frame is only 0.2 kg (0.5 lb) heavier than the CR's; therefore, the CRF450R's 449-cm3 four-stroke engine has a mass of only about 5.4 kg (12 lb) more than a 250-cm3 two-stroke. Honda achieved that weight through the application of racing technology and by not employing technology that could add weight. Yamaha's YZ426F, in comparison, features a double-overhead cam, five-valve design. Honda opted for a single cam head with four valves. The 36-mm (1.4-in) intake valves are titanium, with a mass of only 24.8 g (0.87 oz) eacha savings of 15.2 g (0.54 oz) compared to steel valves. The camshaft acts directly on the intake valves, but opens the 31-mm (1.2-in) steel exhaust valves through a forked, low-friction roller rocker arm. The rocker has roller bearings at its tip, enabling Honda to reduce its size because of reduced strain on the rocker. The system has a mass of 377 g (13.3 oz) less than a comparable DOHC arrangement, according to Honda. The 96-mm (3.8-in) diameter piston is only 33.6 mm (1.3 in) tall. It looks like a disk with wrist pin bosses. The disk is wrapped by two rings instead of the usual three. A single compression ring and an oil-control ring are sufficient for a racing-only engine. The 261-g (9.2-oz) piston is 114 g (4.0 oz) lighter than a traditional piston with full skirts. The cylinder is Nikasil lined for reduced friction, contributing to cooler running and extended engine life. The single-overhead-cam arrangementHonda calls it "Unicam"is smaller and lighter than a comparable double-overhead-cam configuration, according to the company. Oil control is a less significant problem for the CRF than on most four-stroke engines because it employs needle bearings for the crankshaft end of the connecting rod. Most engines use plain bearings that require more oil than needle bearings so there is more oil in the crankcase. The CRF has a reduced oil supply in the crankcase to cut friction losses from the crankshaft and rod churning through oil. The engine and five-speed transmission have separate oil supplies, which is unusual for a motorcycle, to keep clutch and transmission material contamination from reaching the engine and provide the clutch with a cooler supply of oil. Kickstarting a stalled, large-displacement, one-cylinder engine is a challenge welcomed by few riders, least of all those who may have just crashed during a race and want to remount and continue as quickly as possible. Honda has built in an automatic compression release that makes starting easier. The kickstarter is also designed so it works in any gear, again saving riders time when they hope to return to the fray. 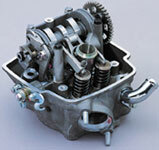 The engine's flat-slide carburetor features ball bearing on the slide, reducing throttle pull resistance so the rider's wrist doesn't get as tired during races. Dual radiators dissipate heat more effectively than a single unit, and a titanium header pipe trims weight from the exhaust system.